Today's organizations encompass a diverse range of users, from road warriors using laptops and mobile devices as well as power users working with demanding high-end applications, to task workers performing standard, relatively predictable processes. 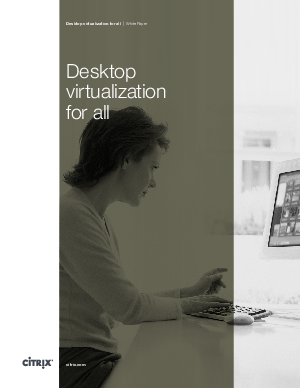 A one-size-fits-all approach to desktop virtualization cannot meet all the different requirements of these users. In the past, this would have required the implementation of multiple solutions from multiple vendors - a prohibitively complex and unmanageable strategy. Citrix FlexCast enables companies to deliver virtual desktops and applications tailored to meet the diverse performance, security and flexibility requirements of every work in the organization.